Always check the surrounding areas near your vehicle for people, especially children, before shifting a shift lever into D (Drive) or R (Reverse). When stopped on an upgrade, do not hold the vehicle with engine power. Use the service brake or the parking brake. The indicator light in the instrument cluster displays the shift lever position when the ignition switch is in the ON position. Always come to a complete stop before shifting into or out of R (Reverse); you may damage the transaxle if you shift into R (Reverse) while the vehicle is in motion, except when “Rocking the Vehicle” explained in this section. 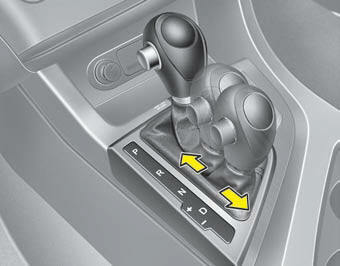 Always come to a complete stop before shifting into D.
Whether the vehicle is stopped or in motion, sports mode is selected by pushing the shift lever from the D (Drive) position into the manual gate. 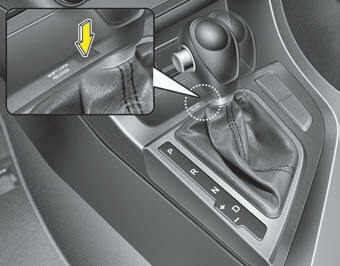 To return to D (Drive) range operation, push the shift lever back into the main gate. 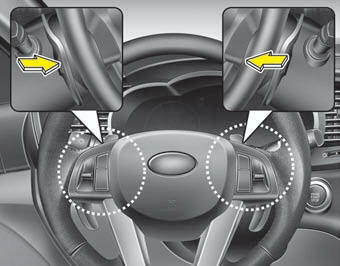 When driving on a slippery road, push the shift lever forward into the +(up) position. This causes the transaxle to shift into the 2nd (or third) gear which is better for smooth driving on a slippery road. Push the shift lever to the -(down) side to shift back to the 1st gear. Pull the [+] or [-] paddle shifter once to shift up or down one gear. For your safety, the automatic transaxle has a shift lock system which prevents shifting the transaxle out of P (Park) unless the brake pedal is depressed. 1. Carefully remove the cap covering the shift-lock access hole. 4. Have your vehicle inspected by an authorized Kia dealer immediately.